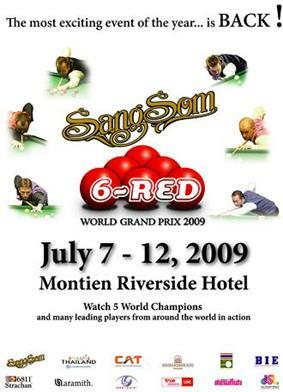 The 2009 Six-red World Grand Prix (often styled the 2009 SangSom 6-red World Grand Prix for sponsorship and marketing purposes) was a six-red snooker tournament held between 7 and 12 July 2009 at the Montien Riverside Hotel in Bangkok, Thailand. Twenty-three of the tournament's 48 competitors were on the 2009/10 professional World Snooker tour of the more established 15-red game. A relatively high proportion of competitors were from Asia. Jimmy White won in the final 8–6 against Barry Hawkins. The top four players from each group qualified for the knock-out stage. All matches were best of 9 frames. ^ "Six of the Best for White". Global Snooker. 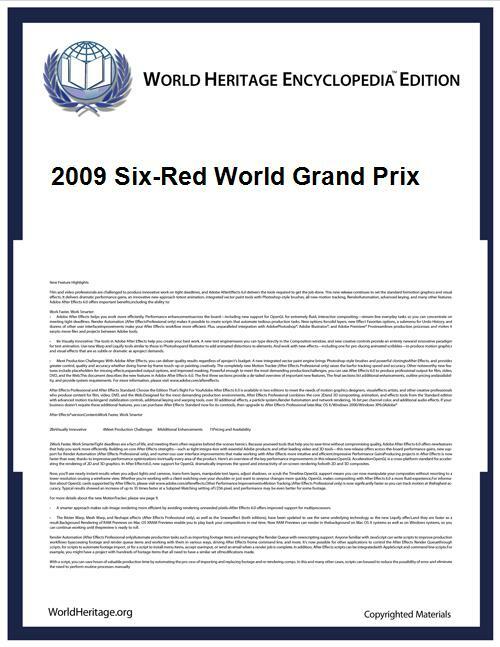 Retrieved 17 April 2010. ^ "Prize Money". African Billiards & Snooker Federation. Retrieved 17 April 2010. ^ "2009 Sangsom 6 reds Groups". Global Snooker. Retrieved 9 February 2011. ^ a b c "2009 Sangsom 6 Reds Results". Global Snooker. Retrieved 9 February 2011. ^ "2009 Sangsom 6 Reds Drawsheet". Global Snooker. Retrieved 9 February 2011.